The Bible is a book of ancient history. Some of its literature goes back at least fifteen centuries before the birth of Christ. The Old Testament is largely the story of the Hebrew nation and the role this people would play in the unfolding purpose of God for human redemption. The culmination of the heavenly plan, of course, was in the atoning work of Jesus, as revealed in the New Testament, along with the establishment of the Messiah’s kingdom. According to the Old Testament narrative, the Israelite people frequently interacted with other nations. For example, in the providential scheme of things, the descendants of Abraham were subjugated, first by the Egyptians and later by both the Assyrians and the Babylonians. Moreover, Jehovah declared that he would punish those pagan powers as well (cf. Ezek. 29:14-15; Is. 10:5ff; Jer. 25:8ff). But are these Hebrew narratives accurate? Can their testimony be compared with the monuments of antiquity and their reliability checked? For centuries the answer to this latter question was no, because the records of these heathen nations remained locked-up, due to language barriers. But as the age of archaeology advanced, that problem was to be resolved. The ancient Egyptians did not write with an alphabetic script as we do in English. Rather, they used a form of writing known as hieroglyphics. Scribes, using pens made from reeds and colored inks, would draw a series of tiny pictures to convey their ideas. Unfortunately, for many centuries no one could figure out how to read these enigmatic messages found among the ruins of Egypt. But that circumstance would change. In 1799, an officer in Napoleon’s army made a remarkable discovery. At Rashid (Rosetta), Egypt, Lieutenant Bouchard found a stone slab, designated as the Rosetta Stone, which contained the key to unlocking Egyptian hieroglyphics. The slab of black basalt, now in the British Museum, is three feet nine inches high, two feet four and one half inches wide, and eleven inches thick. It dates to the year 196 B.C. The Rosetta Stone contains a decree written in honor of king Ptolemy V of Egypt. The significant thing about this tablet is the fact that the script was composed in three different forms. At the top, the message was in Egyptian hieroglyphics (fourteen surviving lines). In the middle, represented by thirty-two lines, was a simplified form of Egyptian writing known as demotic, meaning common or popular. Finally, at the bottom, the inscription was in Greek (fifty-four lines). The Greek text could be read easily, so scholars began the task of translating the Egyptian picture-characters. Within a few years the French scholar Jean Francois Champollion was able to decipher the language. He produced an Egyptian grammar and dictionary and brought to light many texts from the land of the Pharaohs. 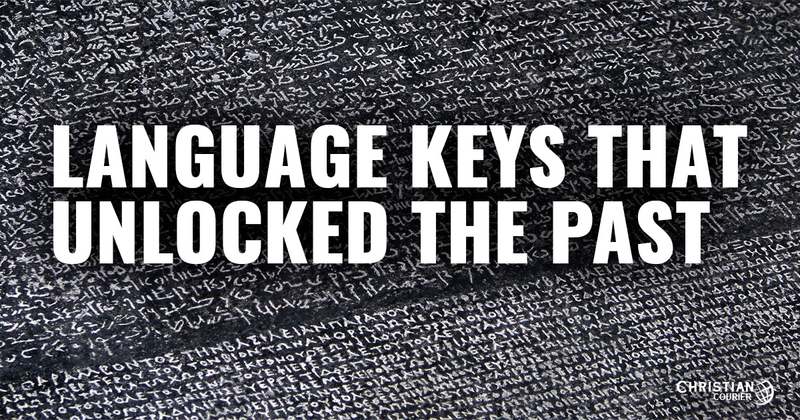 Consider the importance of being able to unlock the Egyptian script. In 1896, the famous Merenptah Stele was found in Thebes, Egypt. A stele is a stone slab containing an inscription. In a text relating to Egyptian activity in the early thirteenth century B.C., this tablet referred to Israel as one of the peoples of Canaan. Prior to this find, there was no extra-biblical documentation that Israel existed that far back in history. In fact, this is the only artifact thus far discovered in Egypt that mentions Israel by name. This stele is an important piece of evidence in confirming the historicity of the Old Testament. Near the city of Behistun in Persia (now northern Iran), there is a rocky mountain, about 1,700 feet high. On the side of the mountain, some 350 feet up, is an area that is almost perfectly vertical. On this huge “tablet” is a series of carvings. The imagery depicts a ruler (eventually identified as Darius I of Persia [cf. Ezra 4:5, 24; 5:1-17]), two officials, and ten captives (bound neck-to-neck with a rope). There are also scripts that accompany the human figures. In 1835, Henry Rawlinson, a young Englishman in the Persian Army, set out to study the inscriptions. He spent several years, on and off, copying the unknown characters. It was a very dangerous enterprise. Rawlinson had to work from a precipitous ledge about fourteen inches wide (some thirty-five stories from the ground below). At times he perched on a tall ladder. On occasion, he sat in a swing suspended from above. Eventually, Rawlinson discovered that the inscriptions represented three different languages—Babylonian, Elamite, and Persian. A comparison of these languages provided scholars with the key needed to unlock the cuneiform writing on many of the monuments and clay tablets of Assyria, Babylon, and Persia. This discovery helped demonstrate that numerous biblical statements whose accuracy had been disputed by critics were correct. For instance, after the dramatic destruction of 185,000 Assyrian soldiers in a single night, Isaiah declared that God would move Sennacherib, the Assyrian ruler, to return to his homeland. There he would “fall by the sword” (Is. 37:7). Later, we learn that while the king was worshiping in one of his pagan temples at Nineveh, his own sons smote him with the sword (Is. 37:38). The biblical text is confirmed!